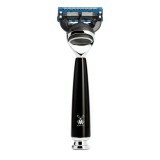 The multi blade system guarantees a very close and safe shave. These razors commonly have 3, 4 or 5 blades positioned close together to evenly distribute the shaving force, protection offered by guards to make this one of the safest shaving systems available and lubrication strips to ensure a smooth and comfortable shaving experience. MÜHLE RYTMO - High-Grade Black Resin 5-Blade Razor. ..
MÜHLE RYTMO - High-Temperature Treated Ash 5-Blade Razor. 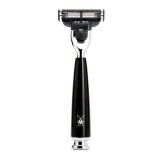 ..
MÜHLE RYTMO - High-Grade Black Resin 3-Blade Razor. ..
MÜHLE RYTMO - High-Temperature Treated Ash 3-Blade Razor. ..